On Friday at 9pm myself and one of my best friends decided to buy tickets to a football game taking place on Saturday 13 hours away. An hour later we left and drove through the night and the next morning to get there. My buddy Chris and I are no strangers to road trips. We’ve been pals since high school and have completed a number of them. For spring break our senior year, we drove to Austin, San Antonio, and North Padre Island. One time in college we randomly decided to drive to Kansas City over the weekend. We’ve made many o’ trips to Dallas for the annual Red River game between OU and Texas and for other reasons. When he was living in DC, we bussed our way to New York. When he was living in Boston, we road tripped to Portland, ME. And, in fact, the last football game we had attended together was the 2009 Orange Bowl in Miami, FL, which required a 24 hour straight drive to Orlando before heading down to South Beach. We’ve shared a lot of miles and football games. The desire to hop on the road and leave is real. Personally, I love it, and have a massive affinity for the Mother Road. 20+ hour drives are something I’ve experienced enough times to know what a physical toll it can take and it doesn’t scare me. Most of all, I enjoy the conversations that the road takes from you. Planes demand quietness and are usually too short to really elicit a meaningful conversation. The road is different. It demands that you contemplate. It’s organized loneliness. An incredible bonding experience. If you don’t follow college football (spoiler alert) we won. Several times while driving to Columbus, Chris and I debated if we were beginning a death march, so it was a nice to leave this one the victor. I wrote a year ago about Ben Scragg came down from Ohio State and stayed at our house. We talked many times about returning the favor and coming to Columbus, but it never felt quite in the cards being that the Fall semester is rather busy travel-wise and I didn’t want to put another trip in the middle of myself and the family. If Chris and I had not had our wives basically pushing us out the door to go, we would have been watching the game at home. They are the real MVPs. Ben was kind enough to let us park at his house and, though he wasn’t in town, he wrote an extensive email of things to do and sites to see, which helped immensely. I have to say I was incredibly impressed with Columbus, both campus and beyond. First, I wasn’t aware of how big their downtown area was. Campus appears to be off to the side and has it’s own economy. There’s an incredible amount of retail and housing space built around the campus. It feels like student-centric housing–both on and off campus–stretches for days. The campus is sprawling and gorgeous. OSU is known (at least I imagine) for a large amount of intersecting sidewalks which I want to believe create a nice amount of serendipity for student interactions. Ben had mentioned checking out the library, who’s centerpiece is this large display of exposed stacks. We headed towards the football field to grab drinks and I witnessed tailgating on a scale I’ve never seen before. With a stadium that can hold 110,000 bodies, it’s safe to say there’s just a lot of people. The majority of OSU fans we interacted with were very welcoming. The question I received the most was, “Are you really from Oklahoma?” I’m curious as to why this was asked. Was the assumption that outsiders never visit or that Oklahomans never leave? Either way, I was happy to explain myself. The stadium itself was a true sight to be seen. We entered “the horseshoe” from an area called the rotunda. You feel like you are in Rome as you look up at the unpainted, concrete double-decker structure. We were fortunate enough to be sitting amongst friends and enemies. The assumption when you buy seats to an away game is that you’ll be surrounded by fans of the home team. Fortunately, Oklahoma travelled well, and we were never left to defend ourselves. The best conversation was with a man behind us who, despite being decked out in Ohio State gear, was rooting for the Sooners. 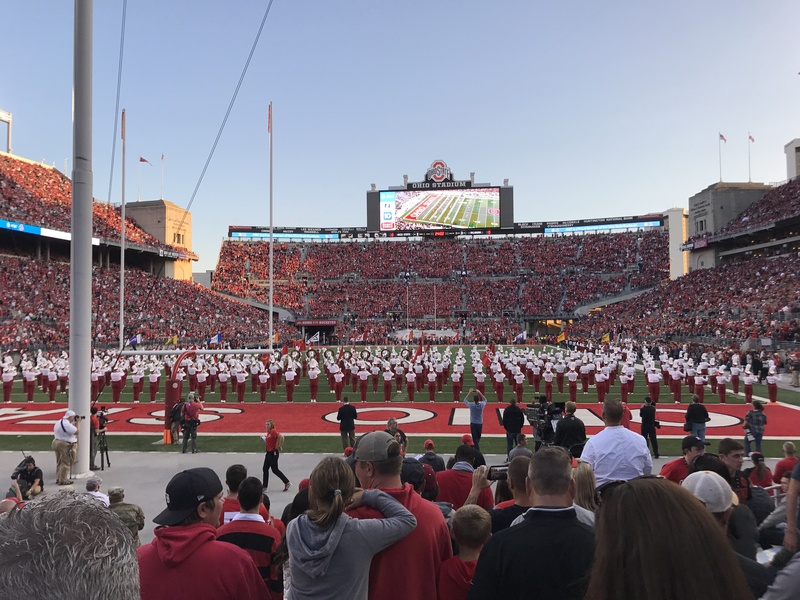 An Ohio native, his daughter had actually opted to study musical theatre at OU her freshman year before returning back to Ohio to study veterinary medicine. He said he fell in love with Norman when they visited and had planned to retired here until his daughter moved back home. After the game and ended and the flag was planted, we unsuccessfully looked for some buckeye candy to take back to the family before heading back home. The worst stretch of the drive was ahead of us as we hadn’t slept more than an hour between us both in the last 36 hours. Night driving on a low tank of energy is never recommended. Chris drove and I dozed off a handful of times before we finally stopped near Indianapolis to catch an hour of shut eye. The game was great and was only surpassed by the conversations. We are both admittedly terrible at forcing conversation, but it comes very natural to both of us given that we’ve experienced a lot of life together. As the saying goes, we’ve seen each other at our best and worst. As I get older, I am no longer taking for granted the opportunities to spend lengthy amount of times with good friends as they become fewer and farther between. Our friendship could have been fully put on ice after college, but we’ve always been intentional about staying in touch (and have even had the chance to work together twice at OU). So my advice is to find that friend and go on three day road trip where you don’t sleep. It’s worth every penny and life is short.